Imagine each morning when you wake up you have an allotted amount of energy. 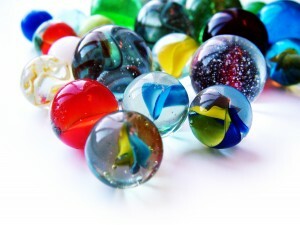 This energy is like marbles in a jar, when you expend a little energy a marble is taken out. As you go through your day “energy marbles” are removed from your jar, one or two for little tasks, more for complex tasks. Let’s say a job requires you to meet and interact with lots of people throughout the day. For Harry, an Encourager, this daily task would be easy and only take a small amount of energy. For Sally, a Tracker, these interactions would take considerably more energy leaving her feeling drained at the end of the work day. The intensity of our behavioral traits can tell us a lot about person-job fit and energy levels. The Norm Line, designated by an N in your WorkTraits profile, marks the average of your highest and lowest traits. Generally, when a trait average is above 4.5, like Harry’s, it is easier for him to pull from all four traits. When an average is below 4.5, like Sally’s, only those traits to the left of the N play a significant role. For Sally, it is more natural to utilize her strengths as a Tracker or Decision Maker. If she needs to pull from her Encourager or Facilitator traits, it will take more energy. This makes it important for Sally to be in a position that is a good fit. If Sally is in a role where she continually needs to pull from her lower Encourager trait, she may lose her marbles.